Starting in the May 1932 issue of Flying Aces and running almost 4 years, Eugene Frandzen’s “Lives of the Aces in Pictures” was a staple of the magazine. Each month Frandzen would feature a different Ace that rose to fame during the Great War. This time around we have one of the great Aces from Les Cigognes—Capt. Armand Pinsard! Armand Pinsard was already a decorated hero by the time war began in 1914—his army service, which took him to Africa, began in 1906. 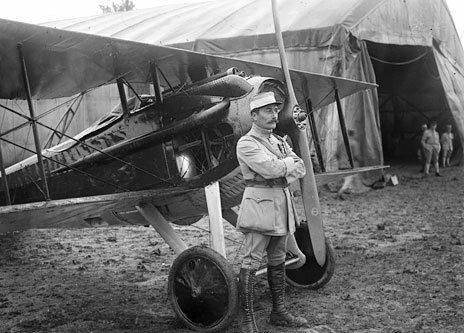 Pinsard was one of relatively few servicemen who made the transfer to the French Air Service prior to 1914—in his case he took to the skies in 1912 and was serving with unit MS23 in August 1914. 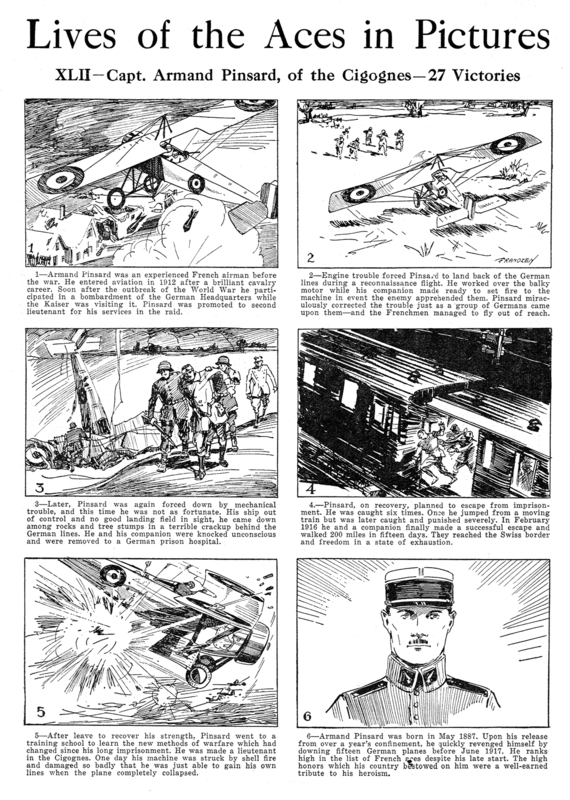 Pinsard was France’s eighth highest-scoring air Ace of the First World War, scoring 27 confirmed victories in total—nine of these were enemy observation balloons. He was the recipient of the Legion d’Honneur (Chevalier and Officier) in 1916 and 1917 respectively as well as Croix de Guerre with 19 palms, Medaille militaire, British Military Cross, Italian Military Medal, and the Moroccan Medal. Pinsard was taken prisoner in early February 1915 after his aircraft was forced to land behind enemy lines. He launched a series of escape attempts in an effort to cross the Allied line and return home. Undeterred after several failed attempts, Pinsard finally escaped with a fellow prisoner by digging a tunnel underneath a 12-foot prison wall after a year of imprisonment. Finally reaching Allied lines Pinsard was given a promotion to Lieutenant and underwent pilot re-training in order to be able to fly the current breed of fighter aircraft. He was then assigned to France’s foremost fighter squadron, Les Cigognes, and later N78 and Spa73. Pinsard went on to serve with distinction during the Second World War, losing a leg during air combat in 1940. He died during a dinner in Paris that he was attending that was sponsored by a group of flying veterans. He was 65.